After cooling, the beads were removed from the wire and often strung as rosaries. Using these beads in the recital of prayer dates back at least to the thirteenth century. In 1569, only a few years before Neri's birth, Pope Pius V officially established devotion to the rosary. As a priest, the production of glass for beads may have formed a part of Neri's ecclesiastical duties. It is worth spending a moment considering the end use of these beads. These carefully formed bits of glass were spread around the world. They could end up as trade currency in any number of locations from the Americas to Africa to Asia to the far east. As mentioned above, they also could find use locally as sets of rosary beads, known as "paternostri" or "our fathers." In both cases they were invested with a value that transcended the raw materials. In the former case it was purely monetary; a unique unit of trade that was distinctive, artful and difficult to reproduce. In the latter case, they served as sequential placeholders in prayer, as objects made by man in the fashion of natural stones or gems, which were physically held and invested with hopes and dreams. In chapter 47, Neri describes a garnet colored glass which is appropriate for small "ferraccia," or pan-fired beads. For these, small lengths of cane were nipped off and pierced with a sharp metal point. A large number of these were then placed in an iron pan, in the furnace, and agitated in order to round them. Neri would supervise the production of beadmaking cane not only in Florence, but also in Pisa, and possibly in Antwerp. 1) Cane can refer to solid cane for wound bead manufacture, such as with lampworked beads, but in this case it most likely refers to hollow canes used in drawn bead manufacture. 2) "Spiei" also suggests drawn beads, not wound beads. 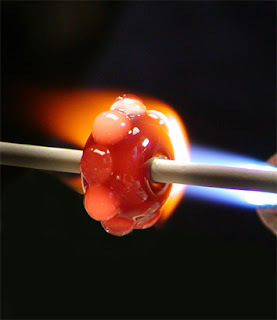 In the 17th century the Paternostri bead making guild used a "spiei," or multi-pronged spit, to heat beads within a furnace and round the short segments of hollow bead cane into finished beads-- also known as the "a speo" method. See Karlis Karklins' great 1993 article in "Beads: The Journal for the Society of Bead Researchers" about this process. 3) "Ferraccia" beads are also drawn beads manufactured from a hollow cane; they are not pierced. In the 17th century these were manufactured by members of the Margareteri bead making guild.